Real Madrid have all but ended their interest in Manchester United goalkeeper, David De Gea after reports emerged in the Spanish media that the European champions will make a move for Athletic Bilbao shotstopper, Kepa Arrizabalaga when the youngster’s contract expires at the end of the season. United have long rebuffed the attempts of Real to sign Spanish number 1, De Gea and this news will come as relief to Jose Mourinho and the United hierarchy who have long refused all offers by Madrid to sign the player. De Gea, 27 has never hidden his intention to return back to Spain so as to be closer to his family and to establish himself as the national team’s number 1. Kepa has grown in stature ever since emerging as the No. 1 at the San Mames and is now De Gea’s understudy in the national team. The former U-21 star is a cheaper, younger alternative to De Gea who will most likely command a world record fee for a goalkeeper if he were to move to the Santiago Bernabeu. 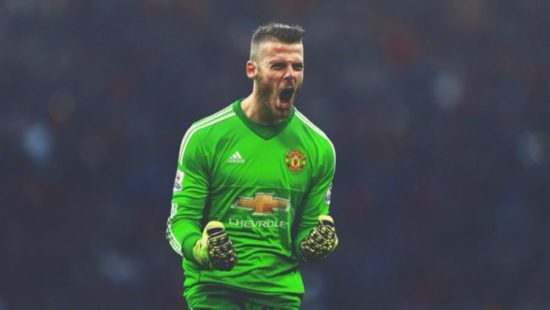 Real Madrid have been looking for a statement signing in the form of a galactico but have been rebuffed in their attempts to sign De Gea, with United standing firm on their stance not to sell the lanky Spaniard. De Gea was sensationally close to a move to Madrid in 2015 however, a documentation gaffe made the deal collapse on the final day of the summer transfer window and the player signing a new four year contract that expires in 2019. As culled by Daily Star, Spanish journalist, Pipi Estrada spoke to El Chiringuito,”Kepa and Real Madrid have already reached an agreement. “There is only one detail – if he arrives in the winter or summer. “Real Madrid wants Kepa to come in the winter market and would pay Athletic €5m more. “And there the problem would be that Kiko Casilla would have to find a way out. “If Athletic accepts that amount that Real Madrid offers, it would be done in January.” He added. Kepa, 23 is a young goalkeeper that is something of a coup for Madrid. He will arrive for a nominal fee, and has the best part of a decade and half to shine for the club. If this report turns out to be very true, it would mean we have De Gea with us for the foreseeable future and he can sign a new contract without thinking of transfer speculation.